Knopperdisk was a Linux distribution designed for a USB pen drive. It was based on Gentoo Linux and contains various programs and utilities, such as network-related tools. Rate this project Gentoo Linux 2007.0 has been released: "After several delays, the Gentoo Release Engineering team is proud to announce the release of Gentoo Linux 2007.0, code named 'Secret Sauce'. This release includes a completely rewritten version of the Gentoo Linux Installer on the AMD64 and x86 live CD and live DVD images. It also includes GNOME 2.16.2, KDE 3.5.5, Xfce 4.4, Mozilla Firefox 2.0.0.3, OpenOffice.org 2.1.0, and the 2.6.19 Linux kernel. Updated hardware support is among the highlights of the x86 release. Besides the many updated office and productivity packages x86 also brings an update to glibc 2.5. On amd64 you can enjoy updated 32-bit emulation libraries improving support for many closed source applications and browser plugins." Read the full press release for further information. Download the installable live CD images from here: livecd-i686-installer-2007.0.iso (700MB, MD5), livecd-amd64-installer-2007.0.iso (698MB, MD5); also available via BitTorrent. 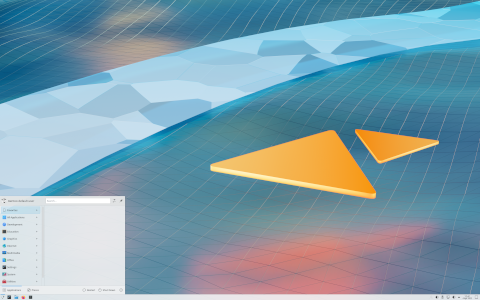 The Gentoo project has announced the release of Gentoo Linux 20160514, a comprehensive live DVD image featuring KDE Plasma as the default desktop. This release comes with UEFI support, ZFS on Linux and writable file system on the DVD: "Gentoo Linux is proud to announce the availability of a new live DVD, code-named 'Choice Edition', to celebrate the continued collaboration between Gentoo users and developers. The live DVD is available in two flavors - a hybrid x86/x86_64 version, and an x86_64 multilib version. The x86-amd64-32ul ISO image will work on 32-bit x86 or 64-bit x86_64. If CPU architecture is x86, then boot with the default 'gentoo' kernel. If the architectures is amd64, boot with the 'gentoo64' kernel. The amd64-multilib ISO image is for x86_64 CPUs only and will not boot on x86 CPUs. The live DVD features a superb list of packages: Linux kernel 4.5, X.Org Server 1.18.3, Plasma 5.6.2, Firefox 45.0.1, LibreOffice 5.1.2, GIMP 2.9.2, Blender 2.72b, Chromium 50.0.2661.75...." Read the release notes for more information. Download links: livedvd-x86-amd64-32ul-20160514.iso (2,871MB, SHA512), livedvd-amd64-multilib-20160514.iso (2,839MB, SHA512, pkglist). Fernando Orocu has announced the release of Gentoo Linux 20140826, a live DVD featuring several desktop environments and many popular up-to-date applications: "Gentoo Linux is proud to announce the availability of a new live DVD to celebrate the continued collaboration between Gentoo users and developers. The live DVD features a superb list of packages: Linux kernel 3.15.6, X.Org 1.16.0, KDE 4.13.3, GNOME 3.12.2, Xfce 4.10, Fluxbox 1.3.5, LXQt desktop 0.7.0, i3 desktop 2.8, Firefox 31.0, LibreOffice 4.2.5, GIMP 2.8.10, Blender 2.71, Amarok 2.8.0, Chromium 37.0.2062.35 and much more. The live DVD is available in two flavors - a hybrid x86/x86_64 edition and an x86_64 multilib edition. The x86-amd64-32ul edition will work on 32-bit x86 or 64-bit x86_64. If your CPU architecture is x86, then boot with the default Gentoo kernel. If your architecture is amd64, boot with the gentoo64 kernel. The amd64-multilib edition is for x86_64 only." Read the full release announcement for further details. Download: livedvd-x86-amd64-32ul-20140826.iso (2,808MB, SHA256), livedvd-amd64-multilib-20140826.iso (2,824MB, SHA256, pkglist). Robin Johnson has announced the release of Gentoo Linux 20121221, an up-to-date live DVD showcasing the current cutting-edge state of the popular source-based distribution: "Gentoo Linux is proud to announce the availability of a new live DVD to celebrate the continued collaboration between Gentoo users and developers, ready to rock the end of the world (or at least southern solstice). The live DVD features a superb list of packages: Linux kernel 3.6.8, X.Org Server 1.12.4, KDE 4.9.4, GNOME 3.4.2, Xfce 4.10, Fluxbox 1.3.2, Firefox 17.0.1, LibreOffice 3.6.4, GIMP 2.8.2, Blender 2.64a, Amarok 2.6.0, MPlayer 2.2.0, Chromium 24.0.1312.35 and much more. There is no new FAQ or artwork the 20121221 release, but you can still get the 12.0 artwork plus DVD cases and covers for the 12.0 release. Special features: ZFSOnLinux; writable file systems using Aufs so you can emerge new packages." The release announcement. Download: livedvd-x86-amd64-32ul-20121221.iso (3,913MB, SHA256), livedvd-amd64-multilib-20121221.iso (4,004MB, SHA256). Robin Johnson has announced the release of Gentoo Linux 12.1, a live DVD demonstrating the latest Gentoo technologies and open-source software applications: "Gentoo Linux is proud to announce the availability of a new live DVD to celebrate the continued collaboration between Gentoo users and developers. The live DVD features a superb list of packages, including Linux kernel 3.3, X.Org 1.12.0, KDE 4.8.1, GNOME 3.2.1, Xfce 4.8, Fluxbox 1.3.2, Firefox 11.0, LibreOffice 3.5.1.2, GIMP 2.6.12, Blender 2.60, Amarok 2.5 , VLC 2.0.1 and much more. Special Features: Gentoo install wizard; writable file systems using Aufs so you can emerge new packages! ; persistence for $HOME is available, press F9 for more info. The live DVD is available in two flavors: a hybrid x86/x86_64 edition, and an x86_64 multi-lib edition." Read the rest of the release announcement for more details. Download (mirrors): livedvd-x86-amd64-32ul-2012.1.iso (3,509MB, SHA512), livedvd-amd64-multilib-2012-r17.iso (3,691MB, SHA256). David Abbott has announced the release of Gentoo Linux 12.0. The live DVD is meant to merely showcase the current cutting-edge state of Gentoo and it does not provide a hard disk installation program. From the release announcement: "Gentoo Linux is proud to announce the availability of a new live DVD to celebrate the continued collaboration between Gentoo users and developers. The live DVD features a superb list of packages, such as Linux kernel 3.1.5, X.Org Server 1.10.4, KDE 4.7.4, GNOME 3.2.1, Xfce 4.8, Fluxbox 1.3.2, Firefox 9.0, LibreOffice 3.4.99.2, GIMP 2.6.11, Blender 2.60, Amarok 2.5, VLC 1.1.13, Chromium 16.0 and much more. Special features: writable file systems using Aufs so you can emerge new packages; persistence for $HOME is available. The live DVD is available in two flavors: a hybrid x86/x86_64 edition, and an x86_64 multi-lib edition." Download: livedvd-x86-amd64-32ul-2012.iso (3,452MB, SHA512, torrent), livedvd-amd64-multilib-2012.iso (3,716MB, SHA512, torrent). David Abbott has announced the release of Gentoo Linux 11.2, a live DVD (with several desktop environments) that can be used to install Gentoo Linux to a hard disk using Gentoo "stages": "Gentoo Linux is proud to announce the availability of a new live DVD to celebrate the continued collaboration between Gentoo users and developers. The live DVD features a superb list of packages, some of which are listed below. System packages include Linux kernel 3.0 (with Gentoo patches), accessibility support with Speakup, Bash 4.2, glibc 2.13, GCC 4.5.2, Binutils 2.21.1, Python 2.7.2 and 3.2, Perl 5.12.4. Desktop environments and window managers include KDE 4.7.0, GNOME 3.0.0, Xfce 4.8, Enlightenment 1.0.8, Openbox 3.5.0, Fluxbox 1.3.1, XBMC 10.1 Awesome 3.4.10 and LXDE-Meta 0.5.5. Office, graphics, and productivity applications include: LibreOffice 3.3.3, Abiword 2.8.6, Scribus 1.3.9...." See the full release announcement for more information. Download (mirrors): livedvd-x86-amd64-32ul-11.2.iso (2,657MB, SHA256, torrent), livedvd-amd64-multilib-11.2.iso (2,840MB, SHA256, torrent). Joshua Saddler has announced the release of Gentoo Linux 11.0 live DVD featuring up-to-date software packages and a selection of desktop environments: "Gentoo Linux is proud to announce the availability of a new live DVD to celebrate the continued collaboration between Gentoo users and developers. The live DVD features a superb list of packages, some of which are listed below. System packages include Linux Kernel 2.6.37 (with Gentoo patches), accessibility support with Speakup 3.1.6, Bash 4.1, glibc 2.12.2, GCC 4.5.2, Binutils 2.21, Python 2.7.1 and 3.1.3, Perl 5.12.3. Desktop environments and window managers include: KDE SC 4.6, GNOME 2.32, Xfce 4.8, Enlightenment 1.0.7, Openbox 3.4.11.2, Fluxbox 1.3.1, XBMC 10.0.... The live DVD is available in two flavors: a hybrid x86/x86_64 edition, and an x86_64 multilib edition." See the release announcement for full details. Download (torrents): livedvd-x86-amd64-32ul-11.0.iso (2,351MB, MD5, torrent), livedvd-amd64-multilib-11.0.iso (2,574MB, MD5, torrent). Matthew Summers has announced the release of Gentoo Linux 10.0, a special anniversary live DVD to celebrate the project's 10th birthday: "Gentoo Linux is proud to announce the immediate availability of a new, special edition live DVD to celebrate this monumental occasion. The live DVD features a superb list of packages, some of which are listed here: system packages - Linux kernel 2.6.30 (with Gentoo patches), accessibility support with Speakup 3.1.3, Bash 4.0, glibc 2.9, GCC 4.3.2; desktop environments and window managers - KDE 4.3.1, GNOME 2.26.3, Xfce 4.6.1, Enlightenment 0.16.8.15, Openbox 3.4.7.2, Fluxbox 1.1.1, TWM 1.0.4; office, graphics, and productivity applications - OpenOffice.org 3.1.1, AbiWord 2.6.4, GnuCash 2.2.9, Scribus 1.3.3.11, GIMP 2.6.4, Inkscape 0.46, Blender 2.49a.... The Gentoo 10.0 live DVD is available in two flavors - a hybrid x86/x86_64 edition, and an x86_64-only edition." Read the rest of the release announcement for further details. Download (mirror list): livedvd-x86-amd64-32ul-10.0.iso (2,558MB, MD5), livedvd-amd64-multilib-10.0.iso (2,651MB, MD5). Matthew Summers has announced the availability of a testing release of Gentoo Linux 10.0, a special 10-year anniversary Gentoo live DVD: "In honor of Gentoo's 10th birthday, we are producing a new live DVD. We need you to test it on as many x86 and x86_64 machines as you can and post bugs. The x86-x86_64 live DVD will work on x86 or x86_64 processors. If your architecture is x86 boot with the default 'gentoo'. If your architecture is amd64 boot with gentoo64. The AMD64 live DVD is for amd64 only. So give us a hand by testing like crazy and posting bugs and we'll have the greatest live DVD ever." The very brief release announcement contains no technical information, but the live DVD comes with Linux kernel 2.6.30, glibc 2.9 and GCC 4.3.2, and boots into KDE 4.3.1 by default (GNOME 2.24 and Xfce 4.6.1 are also available). It can be installed to a hard disk. Interested testers can download the DVD images from here: livedvd-x86-x86_64-10.0.iso (1,849MB, MD5), livedvd-amd64-10.0.iso (1,899MB, MD5).